A smart testing machine, easy for our funiture quality testing. We are well satisfied for these Climatic chambers, a nice testing solution for our lab. 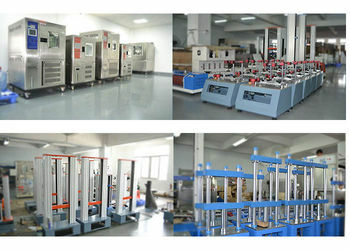 Gaoge-Tech Instrument Co., Ltd, has been specializing in testing equipment for 20 years. We design, manufacture and sale professional testing equipment for global customers. 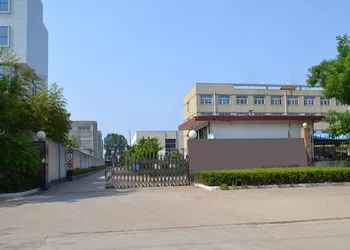 Now our main product include Furniture testing instrument, Bags & luggage test instrument, Environmental Test Instrument, Paper package test instrument, Tensile testing instrument, Printing testing instrument, Adhesive tape testing instrument, Hairdressing product testing instrument, Plastic rubber Testing instrument, Baby products testing instrument, toy testing instrument, Clothing, shoes testing instrument , and many customized testing solutions. They are meet ISO、ASTM、SATRA、TAPPL、EN、AATCC、ANSI、CSA、UL、JIS、DIN、GB、CNS...and other domestic and international standards. We not only provide clients excellent satisfying equipment but also timely lifetime services, like technical advice and after-sales service. Currently, our products have been exported to USA, India, S Korea, Pakistan, Spain, Italy, Russia, Slovenia, and more. We are always seeking to create a new Value. To be your reliable partner for quality testing! For the last couple of years, we focus only on one thing: How to make your QC work better. We think, we design, we apply a different kind of solutions to your quality testing. The name Gaoge first appeared in 2004, when the company was founded in Dongguan, China. The company’s name is a combination of the Chinese meanings of High Quality and innovative spirit. 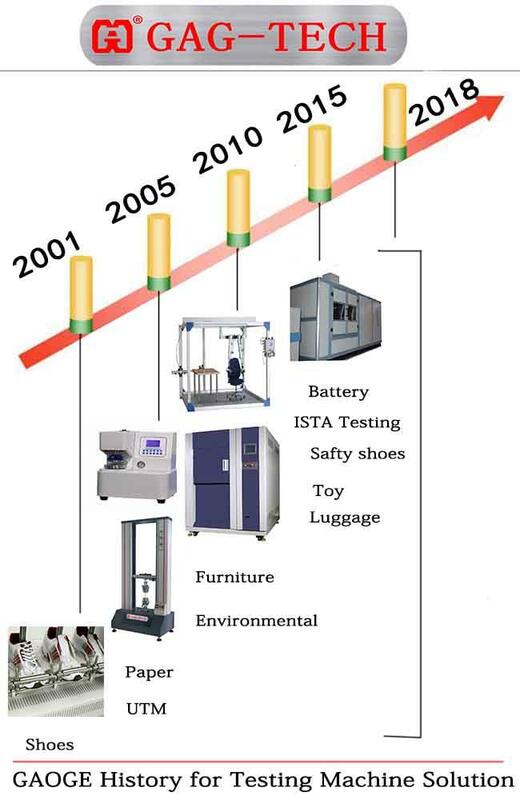 In the early 2000s, Gaoge began developing shoes testing equipment, and the number of machines sold increased quickly. 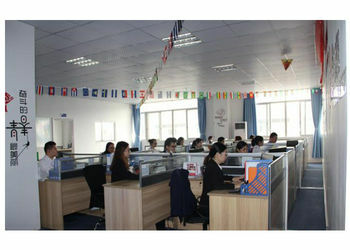 Then, in 2009, GAG founded its 5 sales branch company in China. In 2014, GAG owns a new factory near the expressway of Beijing-Hongkong-Macao(G4). 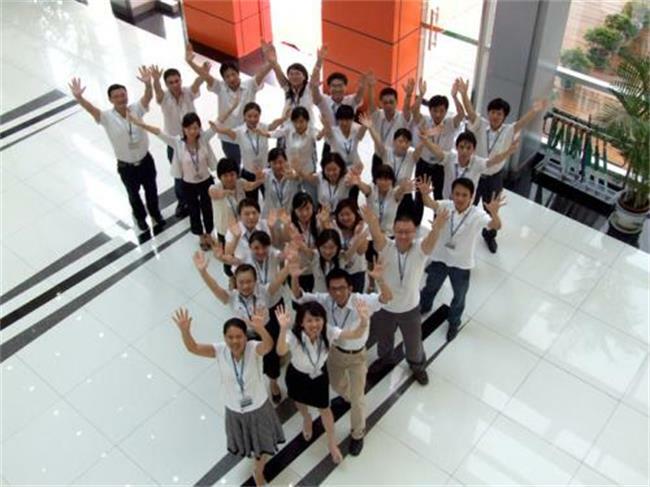 Now our company has its own talented sales, R&D, and service team, who can serve our customers around the world. Come to talk to us. GAOGE-TECH offer 12 hours quick pre-sales response and free consulting. Any kind of technical support is available for users. We offer progressing solution design to all the users. We have mass production and stock & ready item, for these items, we offer 5-7 days quick delivery time. For big machine and special requirement, we will trade you as the priority customer and to produce your cargo for the first time. GAOGE-TECH 1-year guarantee for our machine. And to become you are our long-term customer, we will prolong the quality guarantee period especially for you. We will offer "Training Video", "Instruction Book", "Operation Manual" to you, which is easy to learn and operate. We will supply brochures for simple trouble-shootings of the machine, which will help you deal with the common problems happened to the machine. We will offer plenty of technical support online, just like detailed technical and installation instructions. For example, when you meet a maintenance problem, we will make a video with completed and detailed operation process according to the problem, it just seems that I am on the spot by your side to instruct you how to deal with the problem. Our extensive inventory of spare parts means replacements get shipped to you as quickly as possible. Immediate technical assistance is only an email or phone call away. We insist that our customers receive personal, hands-on training with every machine we sell. This training is free, and we will work with you for as long as it takes to ensure you feel comfortable operating your machine. We pride ourselves on our expertise and our ability to educate our customers in the installation, proper maintenance, and most efficient use of GAOGE-TECH machines. GAOGE-TECH is rather willing to help you to realize your special testing and requirement by our innovative ability. So please do not hesitate to contact us when you need special design or customized machine and OEM machines. 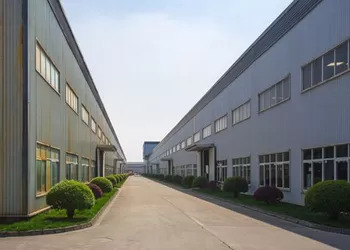 To be the customer of GAOGE-TECH, we will cooperate based on complete trust and comfort. You will find we are a reputable supplier and worth your trust. We understand every customer is valuable. We will value every chance you give to us. GAOGE-TECH brings together the world's top professional talent and technology, has a highly qualified international personnel. Set from software development to hardware design, testing system, technical services are completed by professional and technical personnel. 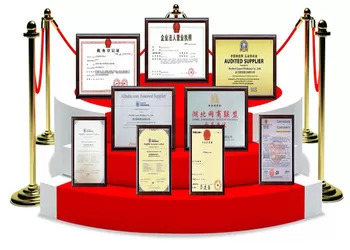 GAOGE-TECH established 1 R&D centers in Dongguan, well-known institutions of higher learning and research institutions at China, work closely with national 10 patents, a number of the core technological achievements and technical indicators at the international advanced level. China Good Quality Quality Control Testing Equipment Supplier. Copyright © 2018 - 2019 qualitycontroltestingequipment.com. All Rights Reserved.